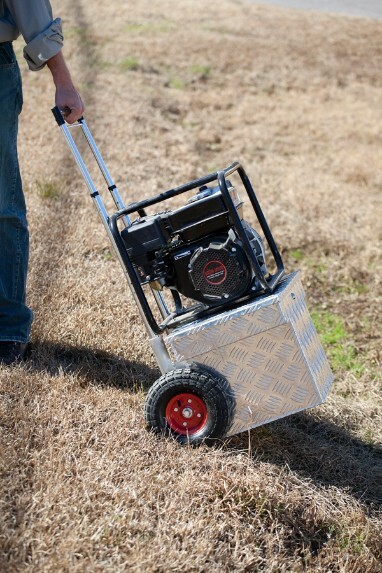 The tool cart is most popular of the patented Simmons Carts but the cart comes in a variety of styles including a fishing and tackle cart, a hunting cart and a multiuse cart. Made from industrial aluminum so not only are you able to carry what you need inside, but on top of the cart as well. Simmons Tool Carts are patented tool carts that provide not only mobility but also tool organization, lockable storage and material handling. Made from welded industrial aluminum, these carts are heavy duty, durable and can handle even the toughest job site. This cart is so sturdy and versatile, it can also be used as a dolly to carry equipment or materials as well as your much needed and well organized tools. No more making 3 and 4 trips to your vehicle to get your tools or supplies. Take it anywhere .. and only make one trip!